Explore brilliant military tactics and go undefeated in a battle throughout the entire Alexander's Campaign. Join Alexander III of Macedon as his general in Alexander's Campaign - competitive historical board game for 2-3 players. 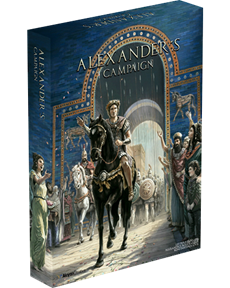 Alexander's Campaign is a fast paced historical boardgame for 2-3 players that follows every step of Alexander's Campaign in the east, from 334 to 324 bc. All the players are represented on the board by Alexander's pawn which they are using it every turn to do one of their possible actions in comparison with their General's (Hetairoi) unique board and special ability. In every round the players striving to recon or conquer enemy cities to complete their personal agenda, to build strongholds or settlements or temples to gain Conquest points, enforcing taxes to claim valuable military and building resources, pass their turn to mess with other players plans and finally using their fighting/building tactics tiles with the best tactical approach in order to fulfill their personal ambitions and to please their King. Alexander's Campaign is now live on the Kickstarter, check it out.